A fresh quick curry using turmeric, to give a little twist from the normal curry. Heat the oil in a large saucepan and lightly cook the onion, spices and chicken until chicken is sealed. Add water, CONTINENTAL Professional Gluten Free Cream of Chicken Soup Mix and KNORR Coconut Milk Powder, stirring continuously. Simmer for 15 minutes or until the chicken is cooked through. 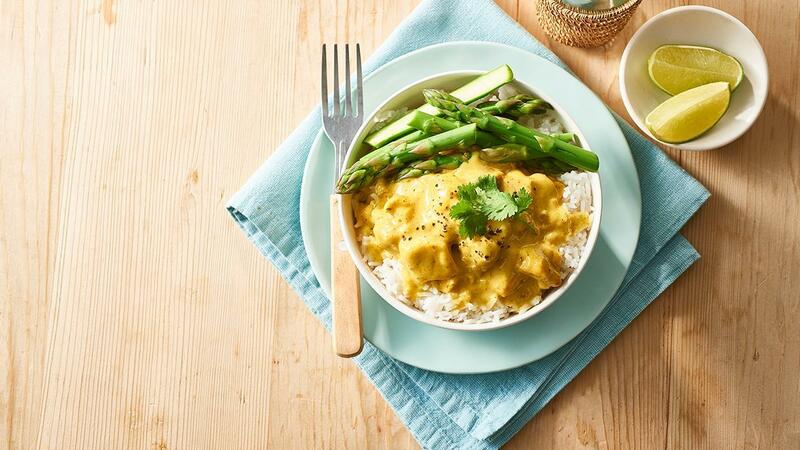 Serve curry garnished with coriander, accompanied with asparagus and steamed rice. Steamed asparagus and steamed rice. Steam rice with KNORR Coconut Milk Powder for coconut rice.